In 1940 the East End of London is taking a terrible pounding from Hitler's bombs. Life, however, goes on, centring around the matriarchal Mrs. Blitztein and her large family, especially her petty-criminal son Harry and her beautiful daughter Carol. They all fight their own particular battles with neighbours and authorities alike through many situations – some humorous, some tragic – and eventually find their own individual peace. Providing scope for a large cast, it features many hit songs, including The Day After Tomorrow, Who's This Geezer Hitler? and Mums and Dads. This modern twist on a Gilbert & Sullivan classic is set against the dreary Arcadia Club, forced to change to a glitzy chrome cocktail bar by Strephon, the half mortal. He fancies the apron off Phyllis the barmaid but must compete for her attentions with the club's members (the Lords) as well as the aging roué who runs the club – the Lord Chancellor himself. 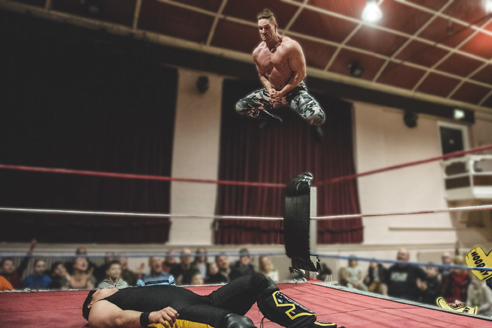 The superstars of WrestleForce return to the Witham Public Hall for another evening of high flying action that the whole family can enjoy! Cheer on your favourite heroes as they do battle against the rule breaking villains! Featuring breathtaking stunts, larger than life characters and incredible interaction, WrestleForce delivers a 2 hour spectacular unlike anything you've ever experienced! Save 10% off these price by booking in advance! Scottish comedy award winner & viral sensation Gary Meikle has risen through the ranks quicker than most and is now in high demand at the best comedy clubs across the UK! He has recently been supporting huge names such as Jason Manford, Tom Stade & Milton Jones and now he’s bringing his own show, The iBrow Guy, to Witham Public Hall as part of his semi-permanent tour! He'll guide us through eyebrow etiquette, logic, laws and how it’s changed his life as he'll now forevermore be known as the eyebrow guy. Gary is not one for mincing his words so expect the unexpected from this playfully dark effervescent rising star. Eastern Angles return with their 2019 touring production. Miss & Mister Pole Essex is returning for its 3rd year, welcoming all styles of pole including theatrical, comical, lyrical, sporty and heels. The event is strictly for over 18s as the compere will be including adult humour throughout the show. On stage will be beginners who have never performed before, right through to experienced polers. A fun, entertaining and unique experience. An entertaining look at the world of antiques with one of its best raconteurs. The second half of the show will be an Antiques Roadshow style look at items brought along by members of the audience, so dig out your family heirlooms and find out their history - who knows what treasures we may uncover!